Crux In The Pocket Barrel-Aged Rustic Saison Ale with Brettanomyces. (image courtesy of Crux Fermentation Project). 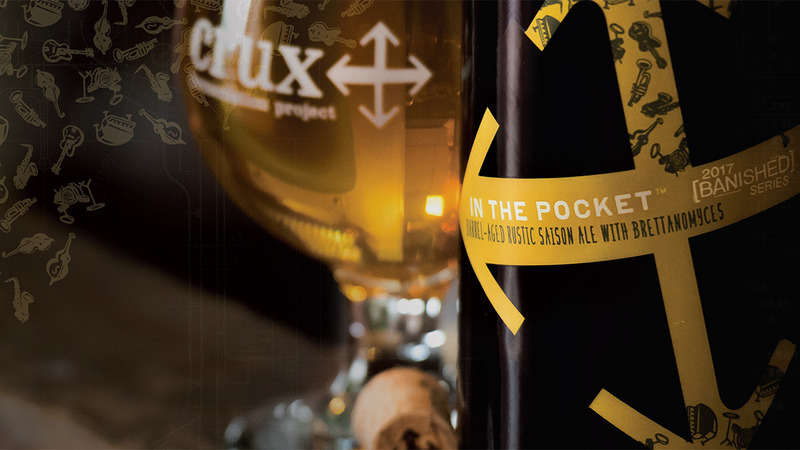 Crux Fermentation Project from Bend, Oregon is back at it with a new release in its [BANISHED] Series of barrel-aged beers with In The Pocket Barrel-Aged Rustic Saison with Brettanomyces. This is the fourth barrel-aged beer to join the [BANISHED] Series that joins Tough Love, Freakcake, and Better Off Red. In The Pocket is the first release in the 2017 [BANISHED] Series that is a blend of two imperial saisons with different maturity. The less mature version had been fermented with Brettanomyces Lambicus and Bruxellensis, while the more mature one was aged for 16 months in Northwest red wine barrels. The barrel-aged portion was first fermented with a saison yeast, secondary fermentation was with Brettanomyces Lambicus. In The Pocket is described as delicate, tart oaky notes are laid down in lock step with the wild pear flavors from the brett duet for a harmonious sensory experience. Each sip reveals a new beat, enticing you to take another. But be careful, at 9.9% ABV this saison drinks easier than you think. The new In The Pocket will be available on draft and in new 750 mL bottles beginning on April 27th. Launch events will take place at the Crux Tasting Room in Bend, The Upper Lip in Portland, and at Whistle Stop in Everett, Washington.